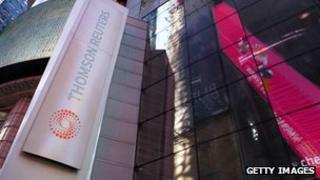 Financial news and data provider Thomson Reuters has said it will cut a further 3,000 jobs as part of a continuing cost-saving plan. The latest cuts are in addition to 2,500 job losses announced in February. Like the earlier cuts, the jobs will mainly go in its financial and risk unit, responsible for renting out computer terminals to clients. The news came as the firm reported a 37% fall in net income between July and September to $283m (£176m). The latest cuts amount to about 5% of the company's total workforce. Chief executive Jim Smith said: "I think everybody in the world is trying to do more with less." "I don't think the pressure on costs and keeping them under control is going to lessen," he said. Mr Smith said he hoped the strategy would lead to a more "predictable path" in the future. Thomson Reuters also said it would repurchase up to $1bn of its shares by the end of 2014. Mr Smith said he wanted the company to be "less reliant on acquisitions".